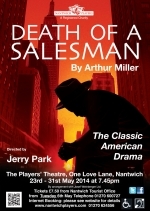 Willy Loman has spent his life as a travelling salesman, extolling the benefits of his product and of the American way of life. When his mind and career start to disintegrate, he begins to look back on a lifetime of self-deception and betrayal, and review his relationships with his employers, his wife and his sons. But does he see things as they really are? This is one of the greatest plays, by one of the greatest playwrights, to come out of America in the 20th century. Directed by Jerry Park, performances will be at 7.45pm, 23 - 31 May 2014. Tickets on sale Tuesday 6th May at Nantwich Civic Hall (01270 600727).